As you are probably already aware, I like nail polish a little bit, well ok then, I have a bit of a problem with buying nail polish, ok ok there I said it, it's out there, I am a nail polish addict! I first spotted the Barry M Gelly Hi Shine Nail Paints on one of my rare trips out to the shops, I was in Superdrug and the colour of one of the polishes caught my eye, I was ready for home though, tired and in pain and really couldn't be bothered to queue, but later on in the day I wished I'd picked it up, typical! Last weekend Simon was heading to the local retail park to go to Pets At Home for our animal supplies, and he asked if I'd like to go with him (wow he knows how to show a girl a good time) joking aside, there is also a Boots and Next on the retail park so it means I can go to a couple of the shops I like without having to take a trip to a shopping centre, meaning more walking and travelling both of which really do me in. Whilst in Boots I noticed they had all thirteen of the colours of the Barry M Gelly Hi Shine Nail Paints in stock and they had an offer on, if you bought two you got £1.00 off, not the greatest offer in the world but a pound is a pound I suppose. I was drawn most to the two pink colours Grapefruit and Dragon Fruit, it was Dragon Fruit I had spotted a few weeks ago when I first saw the polishes so I knew I wanted to get that one and I really liked the vibrant shade of the Grapefruit. I have read a few reviews on the gelly polishes and also watched you tube reviews and have seen lots of people say they are "exactly like a gel manicure" they "last for so much longer than normal Barry M" and "you only need one coat" so I thought for £3.99 and a pound off for two, I couldn't go wrong really could I? Or could I? The first polish I tried was Dragon Fruit, first of all I applied my Orly base coat Bonder and then three coats of the Dragon Fruit, yes you read that bit right, three coats. As I mentioned previously I had seen reviews on these where people said they only needed one coat, I'm going to be blatantly honest now and there is no way on Gods green earth you could get away with one coat of these, even after two coats I could still see those annoying little gaps you get in the polish just on the odd nail, you know the ones I mean. I am a bit of a perfectionist and maybe you could get away with two coats but for the opaque finish I like I needed to use three coats. I finished off by using my Orly top coat Glosser. As you can see from the photographs the polish is very glossy, Barry M claims that the polish gives you an extra glossy finish, which it does indeed, but having had gel nails (Gelish) quite a few times over the last couple of years I don't think the polish resembles a gel manicure, it is a little more glossy than other polishes I have tried but in my opinion the finish is that of a thick polish rather than a gel finish. As I mentioned I needed three coats of polish to get the look in the photographs which was a little annoying, especially when I had read and seen so many claims of "only needing one coat." The polish does dry quite quickly which I found a bonus, I am very impatient and hate waiting for my nail polish to dry so I was impressed at how quickly they dried, the polish was as easy to apply as any other Barry M polish I have, there was no difference at all there but they are definitely more glossy in their finish. I used a base and top coat with the Dragon Fruit and nothing with Grapefruit, Dragon Fruit lasted a lot better than Grapefruit, I painted my nails with Dragon Fruit on the Saturday afternoon at around 4pm and they chipped on Thursday, mid morning. I used the Grapefruit on Friday morning at around 9am and it chipped on Saturday, mid afternoon. So as you can tell there was a massive difference with not using the base and top coat with the polish. I would say I got the same amount of wear time out of these as I do with a regular Barry M Nail Paint when I hadn't used a base or top coat. Overall I think the colour range is brilliant, thirteen colours is a good range to choose from and there is definitely something for everyone, the price is great compared to Essie and Orly, the brands I usually choose, but then I did need three coats and only usually need two with Essie and Orly. I would definitely purchase more of these, I have my eye on Prickly Pear, and I never wear lilac nail polish but there is just something about it and I quite like the look of Lychee too, I wasn't put off by the wear time without base and top coat or having to use three coats, I think the polishes are worth checking out if you haven't already done so, there are some lovely colours from pastels to dark shades and they are super shiny and they are also a reasonable price too. I would advise the base and top coat for longer wear time but apart from that, I would say go and try these out if you haven't already. 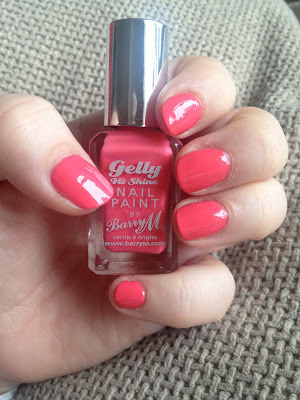 You can purchase Barry M Gelly Hi Shine at Boots, here, Superdrug, here or The Barry M website, here. Have you tried the Barry M Gelly Hi Shine polish? What are your favourite colours in the range? What did you think of them?